If you've been researching Disneyland vacation packages for a while before you arrived here, you know it - and if you're just starting, you'll soon find out: Finding and comparing Disneyland vacation packages is one of the most difficult, complicated and confusing travel-planning tasks you may ever face. I'd dare to say that it's more difficult than planning an African safari (and I've done both). Don't let that worry you, though. I've been looking at and comparing Disneyland packages for years now. I even worked as a Disney Travel agent for a while just to learn more about it and I'm here to share what I've learned with you. What Do You Mean by "Disneyland Packages?" You may think of a lot of things when you say Disneyland packages, but it's good to keep in mind that a vacation package (or holiday package as our friends in the UK call it) is nothing more than hotel, transportation and theme park tickets paid for in one purchase. You may think "savings" when you say "package," but the folks who offer them may not be using the same definition. You'll get the best deals possible if you keep that in mind when choosing one. Easy. If you're busy and you don't have much time for trip planning, you can get everything in one place, have a single point of contact and see the total cost as a single number. Seasonal deals offered January through March (more or less) could have some great prices. Options for penalty-free changes and cancellation that may not be available if you do it yourself, including changing the number of days your tickets are good for. Make changes 30 days or more in advance and you may be able to do it for free. After that, you'll pay a change fee or forfeit your deposit if it's a cancellation. Airfare is the exception and subject to the airline's rules, not Disney's. Vacation insurance is not refundable. Reserve now, pay part of it later. A deposit of a few hundred dollars is required when you make your reservation, but you don't have to pay the balance until 30 days before arrival. 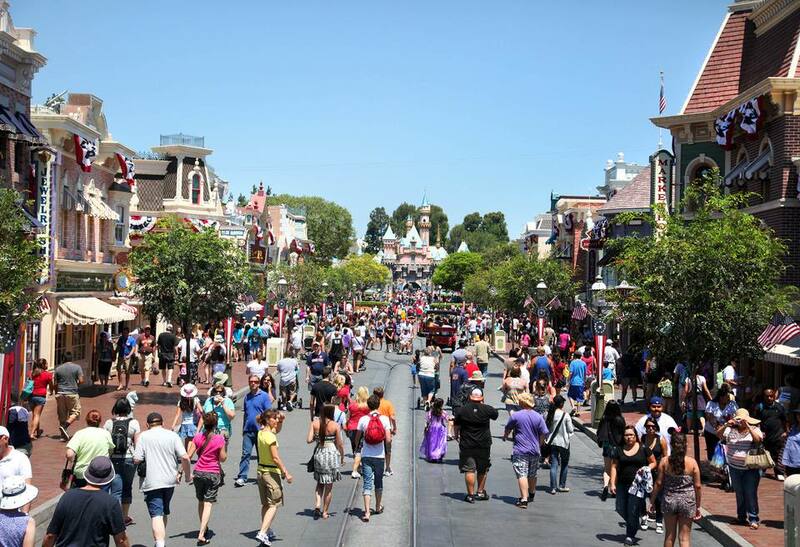 You'll get some extras with many Disneyland packages, which vary by seller and time of year. Some of the most common ones are listed below. Except when low-season deals are offered, you'll usually save money by picking and reserving tickets, hotel, and airfare yourself. You'll be in control of your own schedule and be able to find discounts and features that match your plans and needs. Which extras are important? Look at the list of possible extras below and decide what makes sense for you. As an example, if you're flying to Disneyland and staying in a hotel within walking distance from the park, free parking isn't important. Also, keep in mind that early entry comes with all tickets for 3-days or longer and you don't need a package to get it. How much are those extras worth to you? Put a dollar value on them before you come down with a case of "deal fever," getting seduced into things that don't matter just because they're free. How much are you willing to pay per person for an hour's extra time in the park during a day when it's open from 9 a.m. to midnight? And how much would a pin, lanyard and luggage tag cost if you had to buy them? Use some steps to getting the lowest hotel prices you can - and read about discount ticket options. Grab a piece of paper, a spreadsheet program or whatever works best for you and keep good notes. You'll need them. A bottle of your favorite headache remedy may be needed, too. It's good to know what some of the buzzwords mean before you start shopping. Park Hopper Ticket: Tickets that allow you to visit both parks on the same day, they're the most expensive ticket type and often offered by default. One Day/One Park Ticket: Allows entry to only one park per day, but is less expensive - and totally practical for visits of 3 days or more. Every reservation system has its default settings and some of those for Disneyland packages can make your trip more expensive than it needs to be. These are the questions you need to ask - and things you need to know - to be sure you don't get caught in one of those little "gotchas." How many days of tickets are included? By default, the system will offer tickets for every single day of your reservation, even if you arrive at 8 p.m. the first night and leave at 8 a.m. the last morning. Be sure you get the number of days you really need. Are there less expensive ticket options? By default, you'll be offered Park Hopper tickets, which allow entrance to both theme parks on the same day. If you'll be there for 3 days or longer, you can have just as much fun and save money by switching to One Day/One Park tickets instead. What transportation is included? Do I need it? For hotels outside the Disneyland Resort, local transit passes may be automatically included, even if your hotel is within walking distance, or if you'd prefer to drive your own vehicle to Disneyland instead. Is hotel parking included? If you're staying at a Disney-owned hotel, it won't be (and they do charge for it) and parking at Good Neighbor hotels varies. Is vacation insurance included? How much does it cost? This kind of insurance can be expensive and it's seldom needed. Ask what your options are if you need to make changes and don't have it. Third parties may offer more extras than Disney does. Some of the resources listed below offer extra incentives that Disney does not. Always check airfare separately. It's the most variable component of all Disneyland packages and companies offering packages may depend on only or two carriers who don't serve your area very well. You'll almost always get cheaper airfare by booking ahead and doing it on your own, especially if you live in an area where Southwest Airlines flies. Don't expect to find any single package that includes all of these, but these are examples of extras offered in the past year. Early admission: Exactly what's offered varies and a package will sometimes include access to Toontown before the general public. All tickets for 3 days or longer include one Magic Morning early entry, no matter where you buy them. Disney Visa credit card holders sometimes get an extra gift on arrival. Most recently, it was a backpack. Disney: To minimize frustration with their website, use the old-fashioned method instead. Pick up the telephone and call them at 714-520-5060. Costco or AAA: If you're a member, they sometimes offer some nice extras, often for the same total price as buying directly from Disney.